Lingenfelter Motor Sports facility houses one of the most diverse private collections of exotic, performance, tuner, and muscle cars in the country. Brighton, Michigan, located west of Detroit, is home base of the expansive and ever-evolving Lingenfelter Automotive Collection. The staff at No Limits eMagazine recently received notice of an upcoming charity event taking place at the Lingenfelter Collection in Brighton, MI. And knowing the broad interest of our No Limits audience, we requested and received permission to tour Ken Lingenfelter's awesome auto collection before the crowds arrived. Thus, our Michigan-based crew was assigned the tough task of putting together a story documenting the Ken's wonderful collection of cars. On Friday, 4/25/2014, we walked into the Lingenfelter Motor Sports showroom/office building, located in an industrial park area of Brighton, MI. Brighton is a western suburb of Detroit, and the Lingenfelter Collection is installed in a warehouse-sized building situated just a few miles directly south of GM's Milford, MI proving grounds. As we entered the front-office area of the building, we were immediately greeted by a plexiglas-imprisoned, 1/4-scale styling model of the Lamborghini Reventon (see the real thing below). Mike Copeland, V.P. of Operations was shortly on hand to orchestrate our tour of the constantly changing, 145-vehicle display. The collection is arranged in three separate areas: the first is a room dedicated to exotics and supercars; the next room contains the Corvettes and Lingenfelter products; finally, the third sanctum hosts muscle cars. The lights were on, the floor was clear of pedestrian traffic, so we were off and clicking. As we photographed our way up and down the rows of spectacularly choice mechanical specimens, we were told that the collection is maintained and displayed with one primary goal in mind, to raise funds for the Lingenfelter Foundation's many benefactor groups. Over forty charity open houses are conducted at this location each year. In addition, select vehicles are loaned to other collections around the country. Vehicles are also supplied to charity events and shows on a regular basis. In fact, a handful of significant Lingenfelter-tuned Corvettes were on display at the National Corvette Museum's rotunda dome up until about a week before the heartless sinkhole gobbled up a new and ill-fated fleet of plastic fantastics. The Lingenfelter Collection was initiated in the not-so-distant past by a serendipitous yet entirely disconnected progression in the lives of two cousins, John and Ken. John was an Indiana-based NHRA race driver and owner of Lingenfelter Performance Engineering. LPE builds engines and parts, as well as creating modified and vastly enhanced tuner vehicles for the aftermarket and OEM. Tragically, in 2003, John succumbed to injuries sustained in a racing accident the year before. The future of LPE was in limbo until Ken decided to purchase the company. Ken's interest in automobiles goes back to his childhood and his father's employment with GM's Fisher Body Division in Cleveland, OH. Fisher's Euclid plant was responsible for the body manufacture of Oldsmobile's front-drive Toronado, and Ken's father was hip deep in the development and building of that revolutionary model. Ken continued to feed his automotive obsession through a series of muscle cars and a participation in drag racing. To support that habit, Ken established a successful title insurance company. He also began collecting performance vehicles, including a few LPE-enhanced Corvettes. By 2003, he had sold the title company, and was in a very good position to take over the reigns of LPE. In 2008, he completed the purchase of LPE and the collection of special interest cars began to enthusiastically take shape. Today LPE, best known for its enhanced Corvettes and Camaros, Cadillacs and Chevy trucks, as well as a large inventory of performance parts, operates out of plants in Decatur, IN and Wixom, MI. The Lingenfelter Collection has grown to around 200 cars. 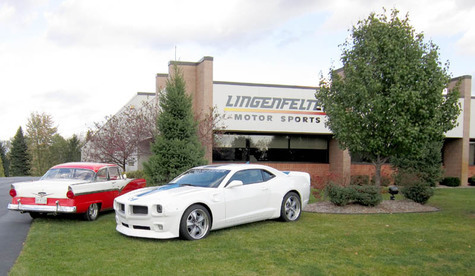 To pay a visit to the Lingenfelter Collection web site, click here. Back to the business at hand, as we occupy ourselves by photographing the amazing variety of Ferraris, Bugatis, Lamborghinis, McLarens, and other equally exotic and expensive modes of transportation. Some choice Lingenfelter-enhanced hardware also spills over into the exotics room. Then it's on to more eye candy in the Corvette Room. As we set our sights on an amazing array of vintage Corvettes, including Bloomington Gold-quality C1s and the '54 "Duntov Mule," a modified test vehicle used to develop the V8 installation in the 1955 model year 'vette, and to set several speed marks in the mid-'50s. A wide variety of modern Lingenfelter produced tuners and a gaggle of Callaway models comprise a large portion of this room's inhabitants. Late-model examples are represented by Greenwood racers, and several commemorative edition C1 and C2 models based on modern C5 underpinnings and interiors. A row of exquisite mid-year restos holds silent court. Limited run Grand Sports, a '78 Indy pace Car, and a trio of late '50s solid axles, are scattered about the room. If you're allergic to fiberglass, you are definitely excused from this area! 2000 Callaway C12, "Inky Blue"
As the owner of a Pontiac GTO, the last display room really held our attention. Pontiac seems to be a particular favorite of Mr. Lingenfelter. A row of Firebirds, including 20th and 25th anniversary packages, a pair of Lingenfelter Hurst Edition machines, along with a 1979 Gold Special Edition Trans Am and an extremely black Formula, both 400/4-speed-equipped, are lined up along one long wall. Four GTOs occupy spaces in one of the middle rows. Another middle row is made up of Camaros. In one corner of the room rests some of the vehicles that the Collection has obtained via charity auction purchases. In addition to utilizing the Collection as a tool to support many charity organizations, the Collection itself is expanded through the purchase of charity-sale cars. Among these examples is the matched pair of Shelby GT500 Mustangs, a 1967 and 2010 Patriot Edition, purchased to benefit the Healing Heroes Network. 1968 Camaro RS/SS 572 "Resto-mod"
Realize, the vehicles housed in the main building represent only three/fourths of the collection. In a nearby facility the remaining fifty or so cars are in climate-controlled storage, awaiting restoration/detailing or are in the process of coming from or going to a deserving charitable event. All in all, this is truly an eclectic, world-class gathering of stunning automotive hardware. In addition to the Lingenfelter Collection's fund raising efforts, the Wixom LPE-North "Engine Build Facility" hosts a collector car cruise-in and coffee klatch every Saturday from May 3 - September 20. Bring plenty of non-perishable food stuffs, as donations are collected to benefit the Gleaners Food Bank. Location of this very altruistic event is north of I-96 and Beck Road, at 47451 Avante Drive, Wixom, MI. Thank you to the great folks at Lingenfelter Motor Sports for putting up with our intrusion on the eve of one of their many charity events, and to Shari Arfons at McCullough Public Relations for getting us in the door with minimal muss and fuss. We can't wait for our next visit! Ken Lingenfelter sits at his office desk at the end of another day in automotive paradise. One of Ken's favorite vehicles, the 2007 Bugatti Veyron. Specs: 8.0L, Quad-turbo, DOHC W16, 987+ hp. 0-100-0 in 9.9 sec. Top speed–250+ mph. 2008 Lamborghini Reventon #12 of 21 built. Specs: 6.5L, V12. Top speed–221 mph. 2003 Enzo Ferrari. Specs: 6.0L, 4-valves/cyl, DOHC, V12. #399 0f 400 built. 651 h.p., 485 lb-ft. Top speed–221 mph. 2005 Ford GT. Specs: 5.4L, supercharged, DOHC V8. 550 hp/500lbs.-ft. of torque. 0-60 in 3.6 sec. Top speed–212 mph. 1 of 4,038 built between 2004 and 2006. 2008 Lamborghini Gallardo Superleggera. Specs: 5.0L, DOHC, V10. 523 h.p./376 lbs.ft. 0-60 mph 3.8 sec. C1 and C2 Corvettes. Car in front right is an Advanced Automotive Technologies 1953-2003 Commemorative Edition car. Black '67 with red stinger was previously owned by actor, Nicolas Cage. Some very special fiberglass from Bowling Green, including a Callaway Speedster. This row of Lengenfelter Corvettes narrowly avoided annihilation-by-sinkhole at the National Corvette Museum last winter. The 1954 V8 test mule car used by Zora Arkus-Duntov to engineer small-block engine fitment, and to set several speed records. A matching pair of '61 'vettes. One is a real '61 and the second is a Classic Reflections Coachworks tribute creation based on modern chassis and interior accoutrements. 1969 Camaro Z/28 equipped with dealer-installed, cowl-mounted/ fresh-air inducted, cross-ram 302. 1966 Olds Toronado pays tribute to Ken's father, who worked for Fisher Body and helped develop the concept and production processes. This 1969 Chevelle station wagon, Yenko tribute car joined the collection just this morning. It is equipped with a 427 and 4-speed. A row of Pontiacs. 1986 1/2 Grand Prix 2+2, 1967 GTO, 1965 GTO, 2006 Lingenfelter GTO, 2004 Woodward Dream Cruise GTO. Strong contingent of Firebirds include two anniversary editions, two Hurst/Lingenfelter editions, and two '79 400/4-speed examples. 1970 Dodge Challenger R/T equipped with the legendary Hemi-head V8. Two Shelby Mustang GT-500s acquired by the collection to benefit the Healing Heroes Network charity organization. 2006 Saleen S7 TT. Specs: 7.0L, Twin Turbo, Aluminum V8. 750 hp/700 ft/lb. 0-60 in 3.2 Sec. Top speed 248 mph.